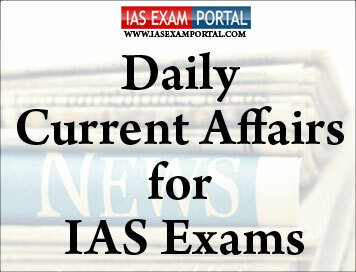 Current Affairs for IAS Exams - 19 JANUARY 2018 | IAS EXAM PORTAL - India's Largest Community for UPSC Exam Aspirants. The Ministry of External Affairs will entertain suggestions and comments on the draft Emigration Bill, 2019, giving an opportunity for Non-Resident Indians (NRIs) to air their views till Sunday. Official sources said the new Bill would ensure the overall welfare and protection of emigrants and it included a proposal to constitute an Emigration Management Authority (EMA). One of the proposals is to make mandatory the registration of all categories of Indian nationals proceeding for overseas employment including students pursuing higher studies abroad. Previously, the Ministry had issued an order on off-loading non-Emigration Check Required status passport holders flying to 18 countries who had not made pre-departure online registration. Now the new Bill focusses on making registration on a digital platform so as to keep emigration a swift, efficient and hassle-fee process. Another salient feature of the Bill is the mandatory registration of recruitment agencies and student enrolment agencies. Sub-agents have also been brought under the ambit of the proposed Bill. The Bill has comprehensive provisions, including insurance, pre-departure orientation, skill upgradation, legal assistance, migrant resource centres, help desks, migration and and mobility partnerships. The Emigration Management Authority will have nodal authorities in all States and Union Territories that will be chaired at Principal Secretary level. The Ministry of Rural Development still hopes to advance further towards the goal by the deadline of March-end, given that about 15 lakh homes have reached the late stages of construction with roofs ready to be added. Another 11 lakh homes have reached the lintel level, and may be completed in the next few months even if they do not meet the March 31 deadline. The scheme has been successful in reducing the average time of construction from 314 days to 114 days, according to an official statement. However, there has been little headway made with regard to one bloc of beneficiaries: the landless, who do not possess the land on which to construct the PMAY homes they are entitled to. According to data provided in the letter, some of the most laggard States as of July 2018 were Maharashtra, which had provided land for only 890 of 1.39 lakh landless beneficiaries and Assam, which had provided land for 574 of 48,283 landless beneficiaries. In Bihar, only 55 out of 5,348 beneficiaries had been allotted land. West Bengal had not allotted land for even a single one of its 34,884 landless beneficiaries. “There are about 2.4 lakh left [to be sanctioned] in Bihar and about 30,000 each in Andhra Pradesh and Tamil Nadu,” said a senior official of the Ministry. Prime Minister Narendra Modi on Friday asserted that his “government achieved the highest growth rate and lowest inflation’ since 1991 when India began economic liberalisation. Inaugurating the ninth edition of the Vibrant Gujarat Summit here, Mr. Modi said the country was ready to do business like never before, listing a host initiatives his administration had taken to attract investments and improve the ease of doing business ranking. We are among the largest ecosystems in the world for start-ups. Doing business with us is a great opportunity. This is also because we are among the top 10 FDI destinations in the world,” he said, noting that India had received FDI worth $260 billion, which was 45% of the FDI received in the last 18 years. In his 20-minute speech, Mr. Modi talked about how his government had ushered in reforms and initiated measures that had helped the economy grow stronger and made India a major destination for investments and business. Over the last four years, the focus of the government had been to reduce government and enhance governance, he added. While food inflation has turned negative since October 2018 and fuel inflation has been highly volatile, inflation, excluding food and fuel, remains sticky at close to 6%,” he said adding such ‘wide divergences and large volatilities’ pose challenges for inflation assessment. High-ranking diplomats from the United States and North Korea are currently holding talks in Sweden aiming to end the stand-off between the two countries, a diplomatic source said on Friday. The source said the delegations included North Korea’s Vice Foreign Minister, Choe Son Hui and Stephen Biegun, the U.S. Special Representative for North Korea. The meeting, which started on Thursday and will continue over the weekend, has been planned in secret for months. Meanwhile, North Korea’s lead negotiator in nuclear diplomacy is due to hold talks with Secretary of State Mike Pompeo in Washington and could also meet Mr. Trump on Friday during a visit aimed at clearing the way for a second U.S.-North Korea summit. U.S. special envoy on Afghanistan Zalmay Khalilzad on Friday held talks with Pakistan Foreign Minister Shah Mahmood Qureshi and discussed efforts to speed up the Afghan peace process by involving the Taliban. Mr. Khalilzad arrived in Islamabad on Thursday from Afghanistan and held delegation-level talks with Foreign Secretary Tehmina Janjua and also met Army chief General Qamar Javed Bajwa. Foreign Office spokesman Mohammad Faisal said Mr. Khalilzad called on Mr. Qureshi. “He briefed Foreign Minister Qureshi on his recent engagements in the region,” Mr. Faisal said. “The FM assured Ambassador Khalizad of Pakistan’s support for the peace process,” he tweeted. Earlier, a statement issued by the Foreign Office on Thursday after Mr. Khalizad’s meeting with Ms. Janjua said that the two sides agreed on “intra-Afghan dialogue” to end more than 17-year-long Afghan war. Mr. Khalilzad is touring the regional countries ahead of a proposed meeting with the Taliban in Saudi Arabia. Pakistan’s support is considered vital for moving forward the peace process in Afghanistan. Its recent efforts to bring the Taliban to the negotiating table have been recognised by the U.S. and Afghanistan. Earlier, Ms. Khalilzad met External Affairs Minister Sushma Swaraj in New `Delhi on January 10. Scientists said that a calculation of the mass of the rings based on gravitational measurements of the planet collected by Cassini indicated they formed between 100 million and 10 million years ago in roughly the final 2% of Saturn’s current age. The ring mass turned out to be 45% lower than previous estimates based on 1980s data from NASA’s Voyager spacecraft. Lower mass indicates a younger age, the researchers said in a study published in Science . Mahendra Singh Dhoni struck an unbeaten 87 to guide India to a historic ODI bilateral series win against Australia. Visitors beat the hosts by seven wickets in the decisive third match in Melbourne today. Dhoni was declared Man of the Series and Chahal Man of the Match. Before this, India had become first team from the sub-continent to win a Test series.